This year I've managed to get some wargaming in nearly every week, and when those games have been 40k I've really enjoyed playing with my Custodes. While relatively simple to play, I've found them very rewarding and have wanted to get into playing some bigger games with them. 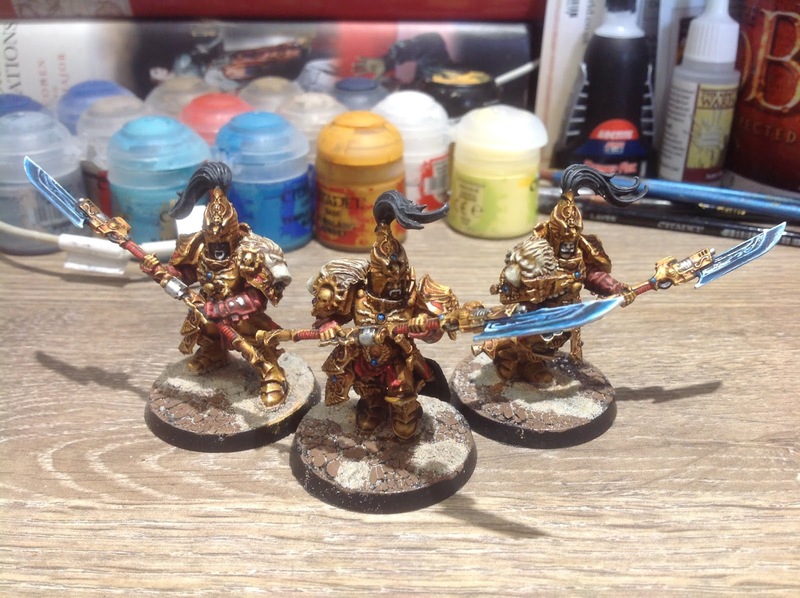 The release of the Venatari tipped my hand and I've now started pushing towards a 2000 point army of pure Custodes. Looking at my existing collection, I only really needed to add three more units of three guys to get there. 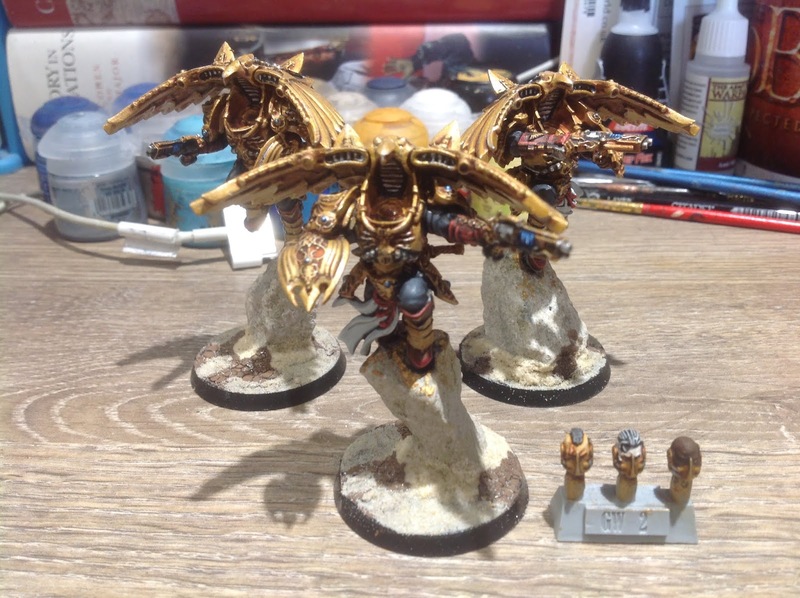 So what I've decided to do is get a unit of Venetari, and a box of five regular Custodian Guard. This box of five has been split into two squads: a squad of three who I've converted into Wardens, and a squad of two basic Custodians (I'm downgrading one of my shield-captains to round this out to a unit of three). The Venetari are lovely miniatures and as soon as I saw them I knew I'd have to get a set. I do have a soft spot for units with wings and I loved the look of the eagle jet-packs that bore these Custodes aloft. The gun and buckler combination is also something a little different from the rest of the army and that bit of variety is quite nice. I'm quite looking forward to trying them out on the tabletop as well as my current force could do with some more fast-moving units and I don't want to just spam jetbikes. 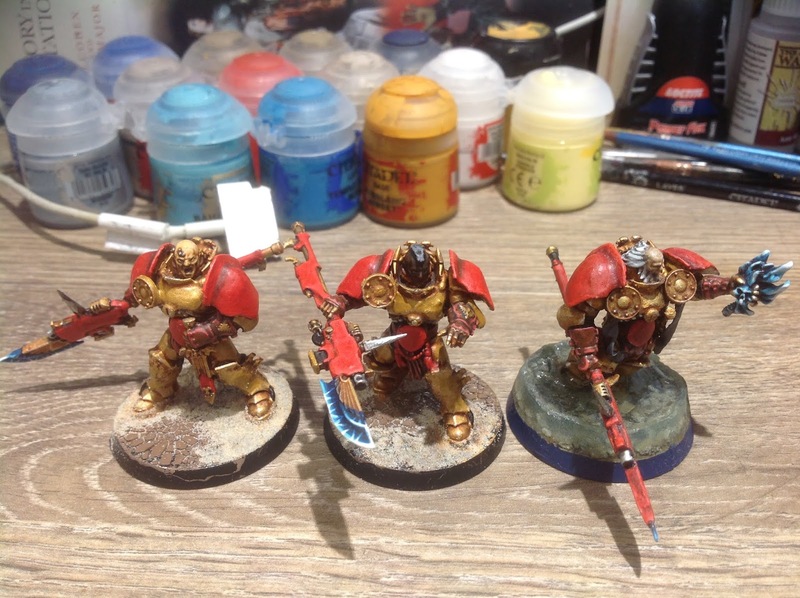 Adding one more squad of basic Custodian guard to my army will let me field a battalion detachment and get a few more precious CP. I decided to downgrade the Shield-Captain I had designed with more stripped back armour and make some more Custodians look like him. I just need to colour-match the two new members of the squad (I need to make their gold a bit whiter) and hopefully they'll look as if they were planned to go together from the beginning. I know Wardens are a way of taking more axes in a Custodes army, but I had these really lovely Guardian Spears left over from the Venetari which I thought would be a waste to squander and thought would make good spears for some Wardens. In order to make them stand out further I added some extras to their armour like a metal skirt over one leg to mimic the robes of the standard Warden miniatures, a lion head on one shoulder, and open-faced helmets which I thought would look suitably unique. Additionally I'm adding a Custodes-themed Inquisitor and an Imperial Assassin to my Talons of the Emperor force as I had them laying around and thought they might be fun to use in the occasional game. The Assassin in particular I'm excited to try something different with his basing, for while most of my army is ankle-deep in water, I'd like to have him stood on the surface of it to give a subtle ninja-like impression. I've been working for the past month and a bit on these guys, and hopefully I'll have them finished by the end of May as there's mostly just tidying up to do on them now before basing. 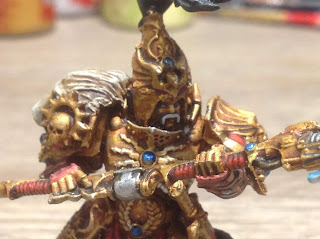 After they are done I'm planning on making a return to the Age of Sigmar with a project I'm really excited about and have been planning for nearly a year. While not an army unto itself, I had these misc. evil miniatures laying around and thought I'd give them a fresh lick of paint. 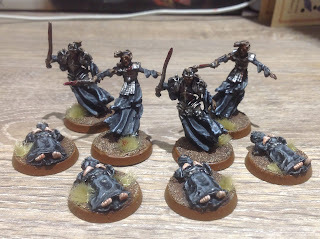 These were quite quick and simple to paint up as they are mostly just dark robes and dingy armour, though I think they convey the mood of these characters quite well. 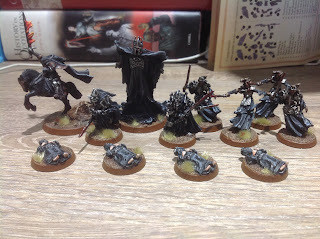 The Necromancer and the Castellans of Dol Guldur are some of my favourite miniatures from the LOTR range due to the incredible detailing on their flowing robes and the cruel menace of their armour. Though I think they are now in the Armies of the Hobbit book, which I don't have so I won't be battling with them, I am very happy to have them in my collection. 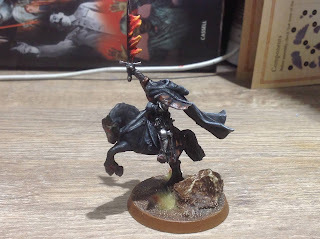 In lore, the Witch-King did not have a fell beast during his rule of Angmar, so I've converted a version of this character on horseback to represent him during that period. I took inspiration from the 'headless horseman' appearance he has in the books, as well as the Ranking/Bass film adaptation of Return of the King. 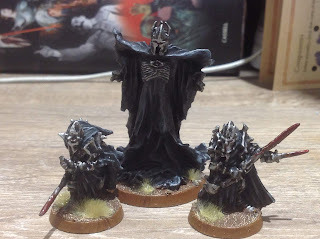 Finally we have some Barrow-Wights whose robes and armour I painted the same as my Nazgul and other evil spirits, and whose skin I painted as if it were mummified flesh. Alongside them I have the four hobbits prepared for sacrifice which I plan on using as objective markers. I really love the Barrow-Wight miniatures and should I ever field an army of Angmar they will be my go-to heroes to lead my hordes of orcs. 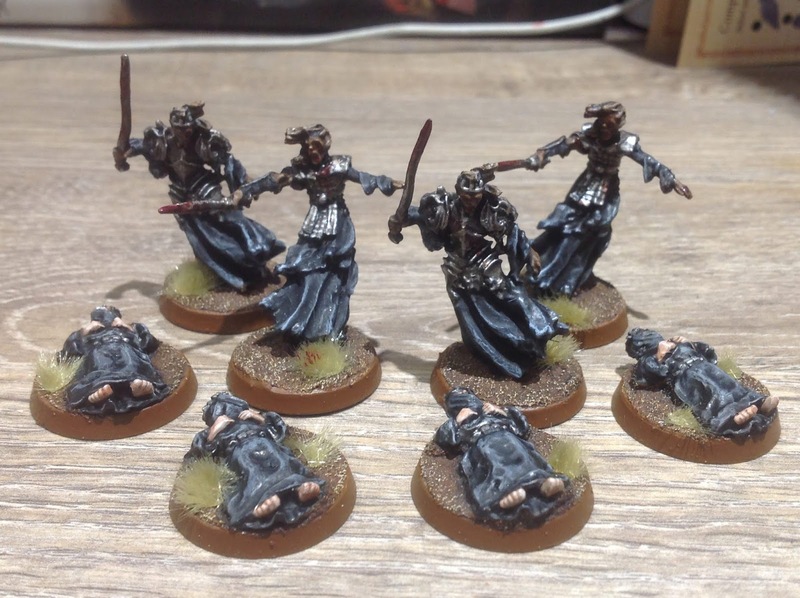 Just to finish off this quick post, here is a collection of my miniatures that would form an ad-hoc Angmar army should I choose to field my Mordor stuff differently. I've no idea if my miniatures will see battle in this manner but it's nice to have the option. This was just a short and sweet little project I did to keep up the Middle-Earth momentum this year after finishing my Mordor army. 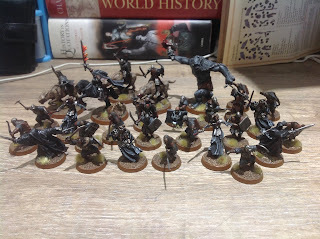 Hopefully I'll manage to get around to my next big LOTR project soon, which will be returning to my army of Isengard. With 'Gondor at War' coming out, for my first Middle-Earth project of the year I decided to shift focus from my Isengard army to my Mordor one. Before I even got painting there was been quite a bit of stuff to fix and convert first which took a significant amount of time. When I first got into miniatures it was through LOTR, and I bought all kinds of random stuff which ended up being horribly converted, mangled, or lost in my formative hobby years. So as I get back into Middle-Earth I am faced with a very mixed collection of miniatures, many of which need reassembling or parts substituting to bring back them back to usable on the tabletop. 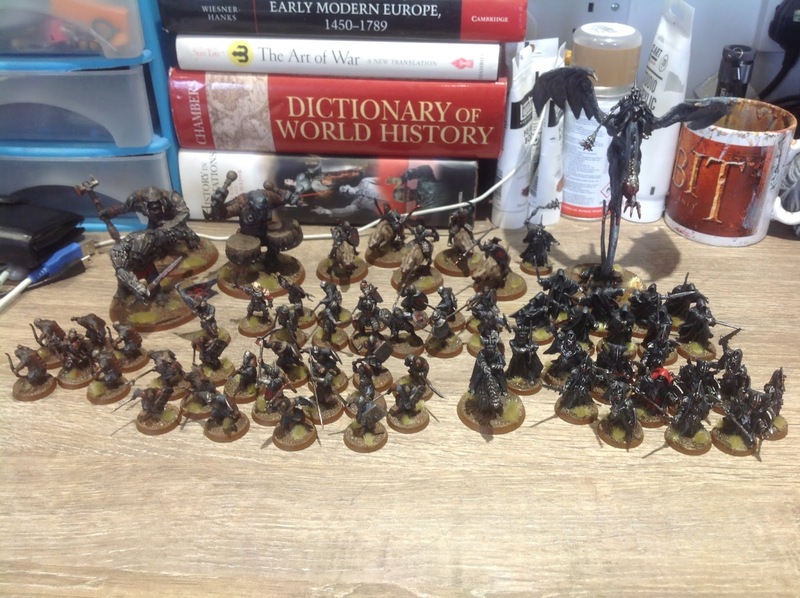 After many hours of work, more green stuff than planned, and some creative solutions to problems, I managed to cobble together an army of Mordor I am quite proud of which will be my go-to force for battles in the next few months while I have a local opponent. 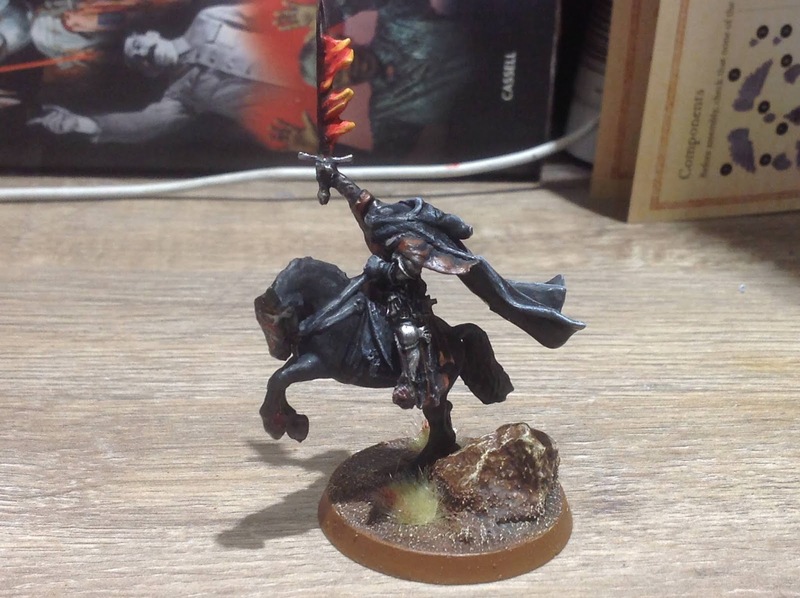 Its not the most technically amazing paint scheme, but its one I feel is faithful to the dark and dingy hordes of Mordor. "...the time of the Orc has come!" Project Orc is now completed! 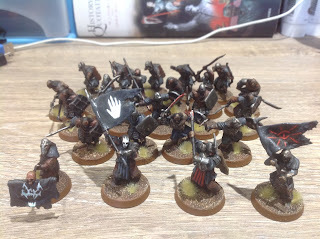 I now have 20 generic orc warriors painted up to use in either Mordor/Barad-Dur, Angmar, or Isengard army, with a generic captain and three banner-bearers for those forces. This was a fun little start to my 2019 plans for my LOTR forces and hopefully soon my completed Mordor army shall be appearing on the blog. 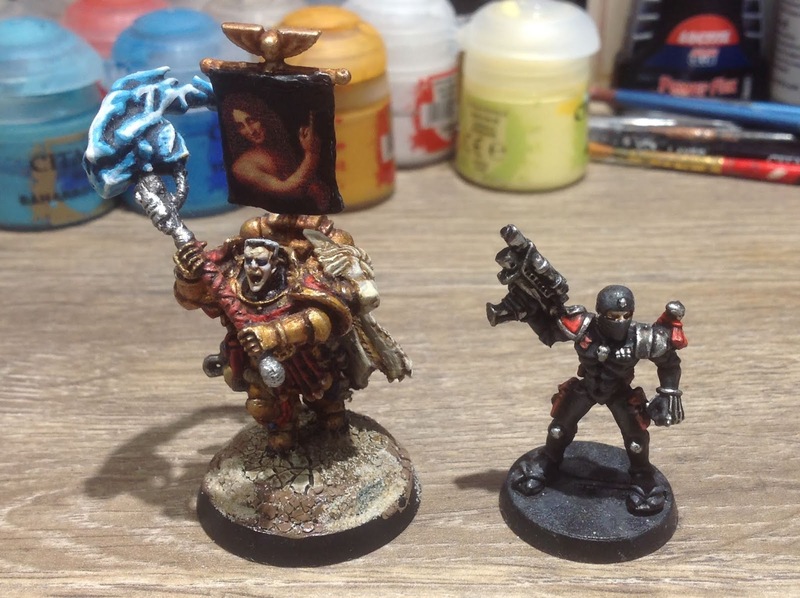 After some more rooting around in my bits boxes and quite a lot of green-stuffing, I have put together my next three Navigators to finish off my war band and I've even started to get some paint on them. I've no idea if they'll ever see use on a tabletop but its proving to be an enjoyable little side project as something very different to my LOTR forces. Hopefully in the coming weeks I'll start getting them finished so check back soon to see the end results. 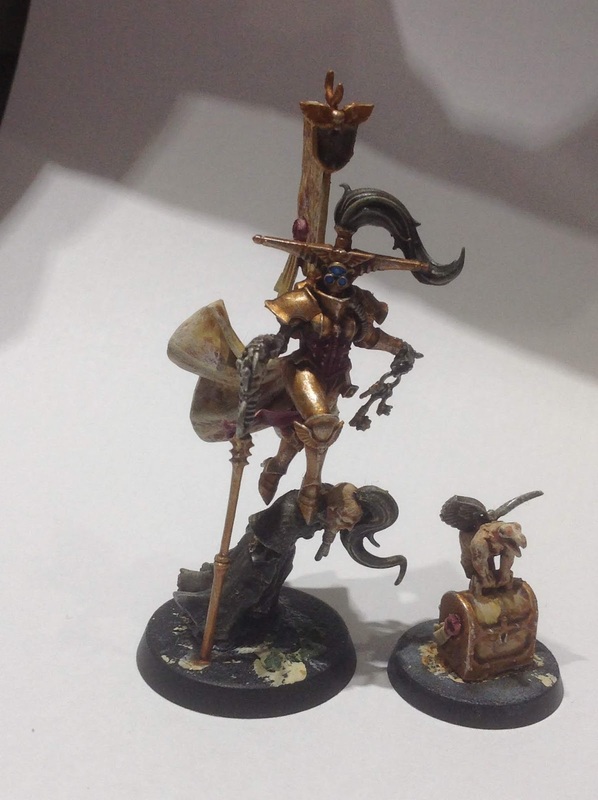 First up we have the leader of this war band whom I'm calling 'The Banker' for now, alongside her familiar. I really wanted to capture the essence of John Blanche in this piece, so theres plenty of weirdness all over. 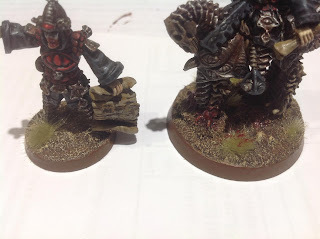 Though probably a negative for gameplay purposes, I wanted this miniature to have great height so envisioned this character striding across the back of some poor slave. I imagine she does not deign to walk the surface of any planet herself so has a small retinue of slaves that she walks upon the backs of whenever she descends from space. The Banker holds a handful of keys in one hand and I thought it would be cool to convert up some kind of chest-based familiar to carry around some campaign funds in. This went through a lot of different iterations, but eventually I managed to cobble together this cyber-cherub with a bird's skull for a head which I thought was delightfully creepy and tied into the crow/raven motif I'm using in this war band. Next we have this chap who I'm thinking of calling 'The Herald' for now who I'm envisioning as a non-combat specialist of some kind. 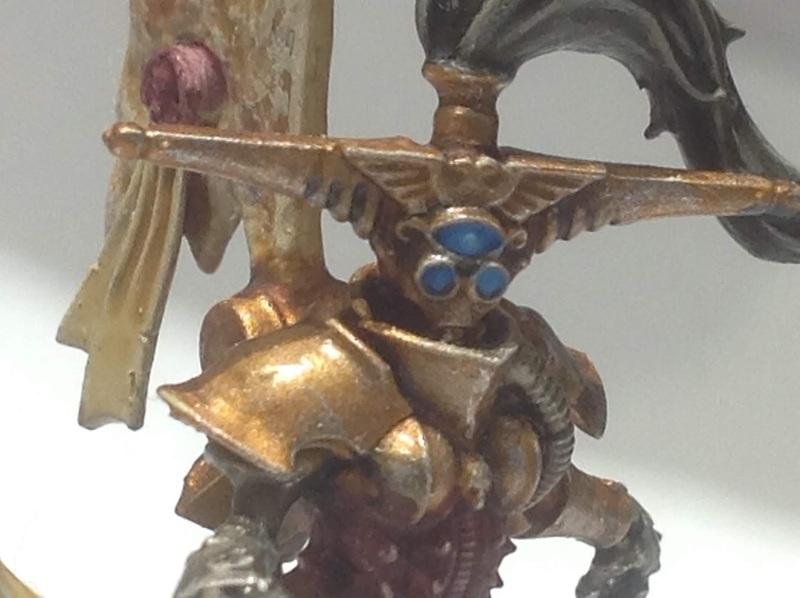 He's based off the old Death Jester miniature with a host of other pieces and a lot of green-stuff on top. 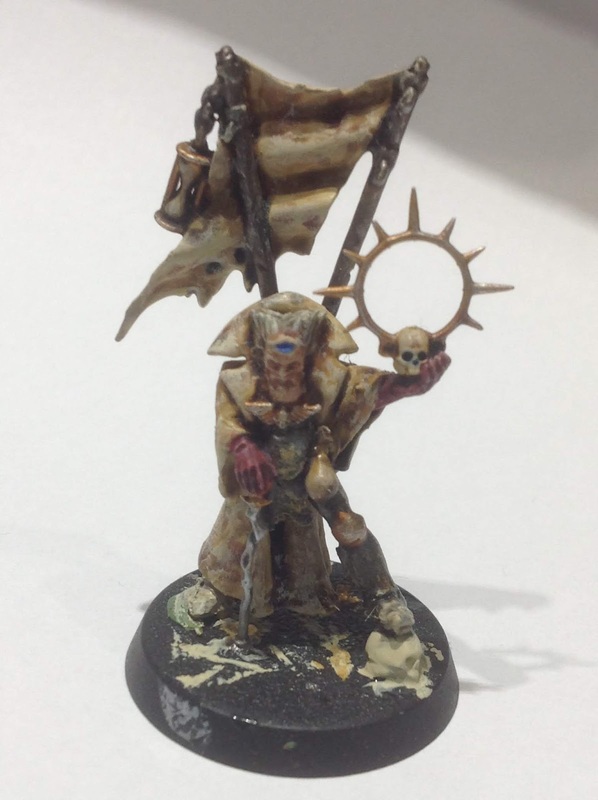 I'm looking forward to doing something fun with his banner, though I'm yet to decide if ill go with some freehand work or if I'll make a custom transfer of some kind. Finally we have the towering mutant Navigator who I imagine is a failed challenger to the rule of the Novator, and as a consequence has been reduced to a walking guinea pig for the house Gene-wrights to experiment upon. Upon his back I've placed a sinister-looking machine which injects him with all manner of mysterious substances and records his battle performance for his brethren to review. 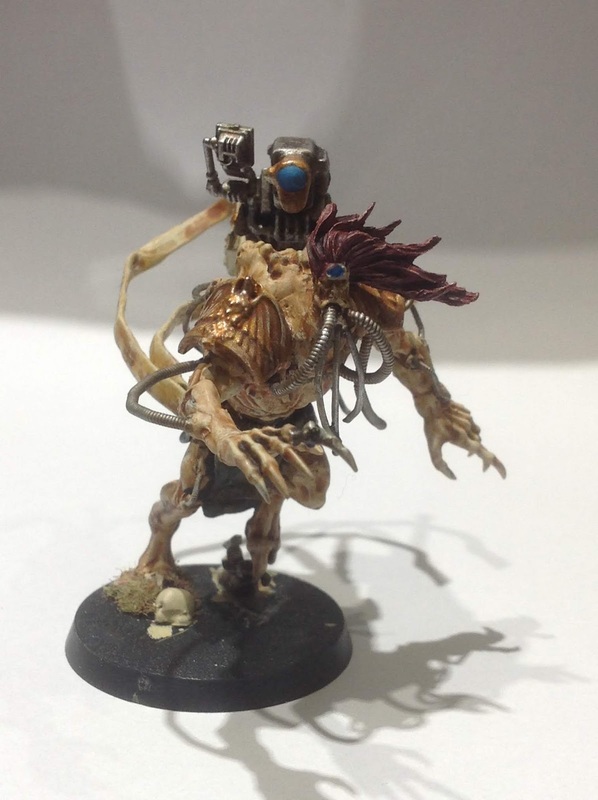 I really wanted to make a big, hulking mutant for this force and thought it would be fun to create a miniature with a lot of movement. St. Celestine's long purity seals and the flowing hair from Fulgrim's head really help add some extra dynamism to the already leaping Crypt Horror body which I think looks really good.